Navy: The background color is navy. The flowers and typography are white, gold and shades of peachy pink. The foil option is gold. Truffle: (pictured above) The background color is a deep chocolate brown. The flowers and typography are white, taupe and shades of aqua and brown. The foil option is silver. Cloud: The background color is white. The flowers and typography are shades of browns and purples. The foil option is rose gold. Size: These invitations are available in 2 sizes: 5 x 7 inches, 6 x 4.25 inches. Trim: The default trim is the curved frame, you can change this to straight edge, rounded corners, waved, or classic frames or bubble scallop. Back Options: The back of the invitations are white. Additional options for the back: a solid color, a striped pattern or there is a range of photo layouts to choose from as well. Envelopes: A white envelope is included. Other envelopes are available such as speckletone kraft or silver envelopes, envelope liners( gold, silver or matching country floral pattern), wrap around return address labels.Your guest’s addresses can be printed directly onto the envelopes as well as your return address on the back flap. 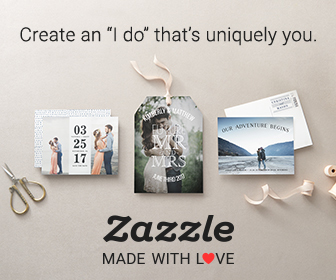 You can also purchase matching and personalized postage stamps. Some of the matching stationery items also have the pressed foil option. I think these rustic country wedding invitations are really pretty. I like the way the flowers have been placed into the layout with the typography. The waved frame trim works well with this design and gives it a special look. 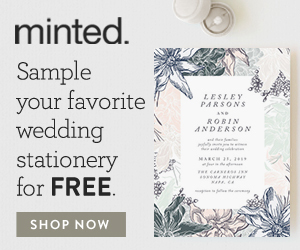 The foil option is great if you would like to incorporate foil into your wedding stationery. These wedding invitations have been designed by Alethea and Ruth.